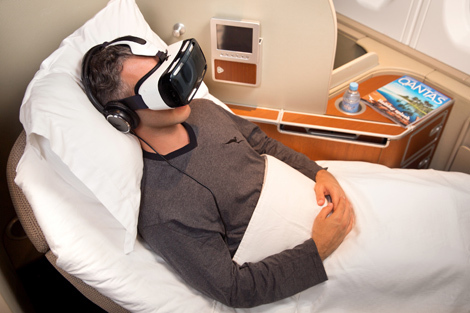 Qantas has teamed up with Samsung Electronics Australia for a trial of a new virtual reality AV entertainment system. Special headsets will be available to customers using the International First Lounge Sydney and Melbourne starting from mid-February. 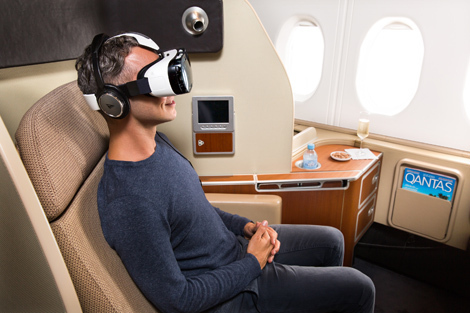 The Samsung virtual reality technology will also be installed in A380 first-class cabins on routes between Australia and Los Angeles starting from mid-March. The device will showcase destinations, new products from the airline and the latest Hollywood blockbuster movies. Tourism NT (Northern Territories) will be the first tourism body to work with Qantas on content creation for the trial system and 3D scenes of Kakadu National Park will be shown. The airline is also working with production company Jaunt to produce destination footage. The trial will run for three months and the airline will gather feedback from users to assess whether the 3D system can be expanded to other long-haul flights.